Argonne scientists have invented a membrane that, when exposed to sunlight, can clean itself and also actively degrade pollutants. Critical tasks such as treating wastewater and processing petrochemicals rely on porous membranes that filter unwanted materials out of water. Over time, these membranes inevitably become clogged by bacteria or other substances, so they need to be replaced or cleaned with harsh chemicals that shorten their lifespan. 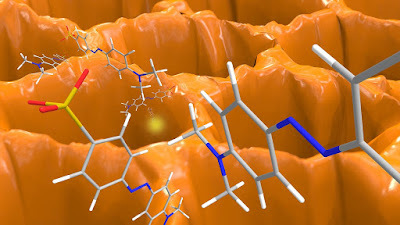 To address this problem, researchers at the U.S. Department of Energy’s (DOE) Argonne National Laboratory have invented a membrane that, when exposed to sunlight, can clean itself and also actively degrade pollutants. The advance paves the way for membranes that can last longer and perform better than those in use today, lowering costs. The main ingredient driving this material’s pollutant-fighting abilities is a coating of titanium dioxide, widely studied for the purpose because it can accelerate chemical reactions when exposed to light. Typically for titanium dioxide, that light must be ultraviolet (UV) — a limitation that increases costs and narrows its feasibility. Argonne researchers took two important steps to achieve sunlight-activated self-cleaning. First, they added small amounts of nitrogen to the titanium dioxide, ​“doping” it so that visible as well as UV light would bring out its photocatalytic properties. Second, they used atomic layer deposition (ALD), a technique for creating thin films often used in the semiconductor industry, to place the coating on the membrane. Unlike the conventional method of dipping the membrane into a solution, ALD grows the coating one molecular layer at a time. This allows all of the membrane surfaces, including the internal nanopores, to be coated uniformly and precisely.